Located in the neighborhood of Jamaica, Queens, New York City, the Queens Library is an independent, not-for-profit corporation which is not affiliated with any library system. 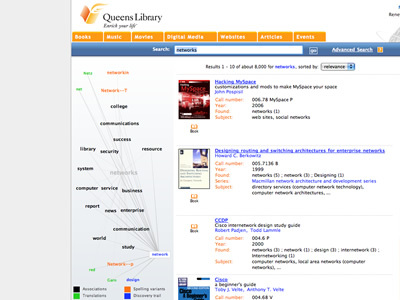 As an integral part of its search functionality, the Queens Library website uses the AquaBrowser Library system by Medialab Solutions. It's an interesting case of a semantic network which allows users to alternatively navigate the library's content though a web of associations, translations, spelling variants and discovery trails. Users only have to enter a query in the search box and press Enter. 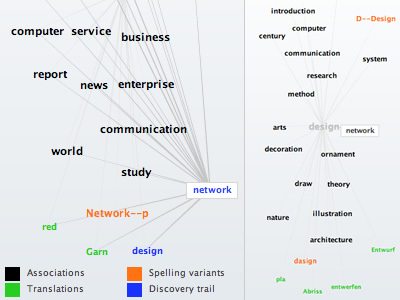 In the central panel, the search results are shown and ranked by relevance, while on the left panel a constellation of words related to the same query shows up. Users can explore the contents of the library's catalogue on both areas.